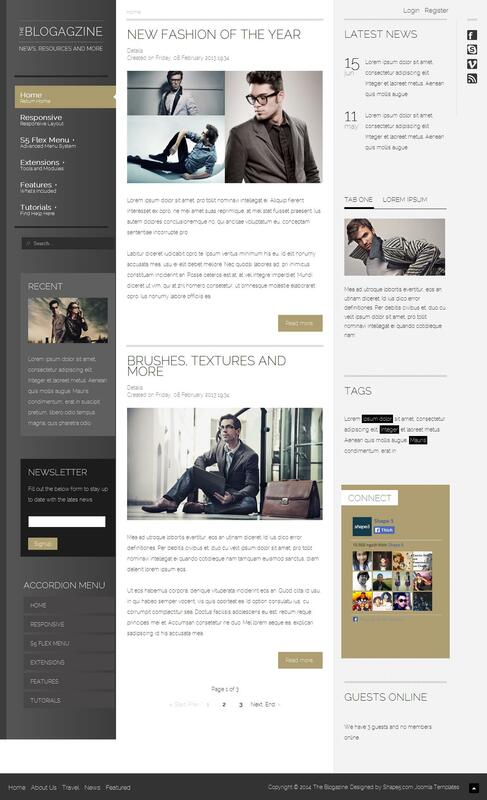 S5 Blogazine - stylish blogging template for Joomla 2.5 from the developers of the studio Shape5. This template is the first development studio, which presents a specialty menu S5 Flex Menu, performed in a vertical style. The template presented a number of functional solutions that change the color of the active menu item, choose modular styles, set a background image, color buttons, and more. Vertex Studio platform provides full control over layout options, you can select the style display content to the left, center, or right side. In the assembly composed of the best club expansion S5 Tab Show, S5 Box and S5 Accordion Menu, allowing users of the website to provide information in an accessible form. S5 Blogazine - an ideal choice for creating professional and modern sites.